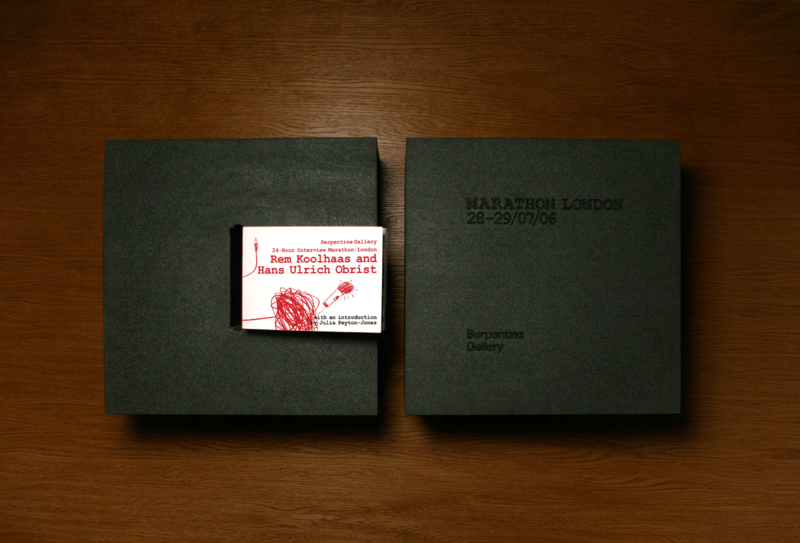 A flip book was conceived to convey the immediacy of the interview marathon event, hosted by Rem Koolhaas & Hans Ulrich Obrist on the Nature of London. Every year the Serpentine Galleries, invites an internationally renowned Architect or Designer to create a temporary pavilion in their grounds for the summer. 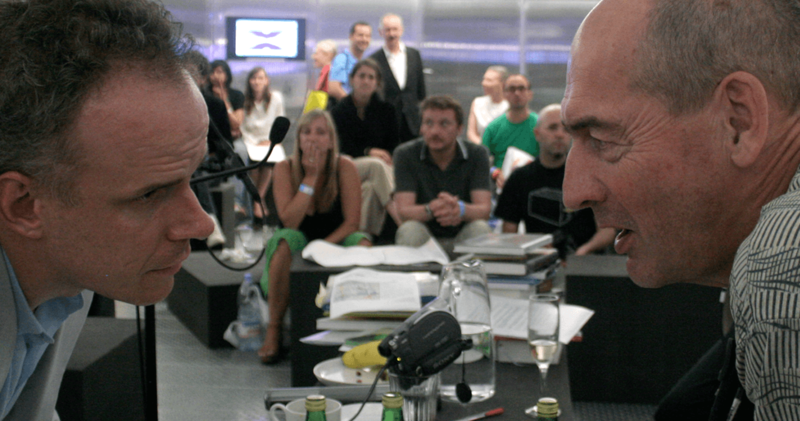 A 24-hour ‘marathon of interviews’ took place inside the Pavilion built by Rem Koolhaas. 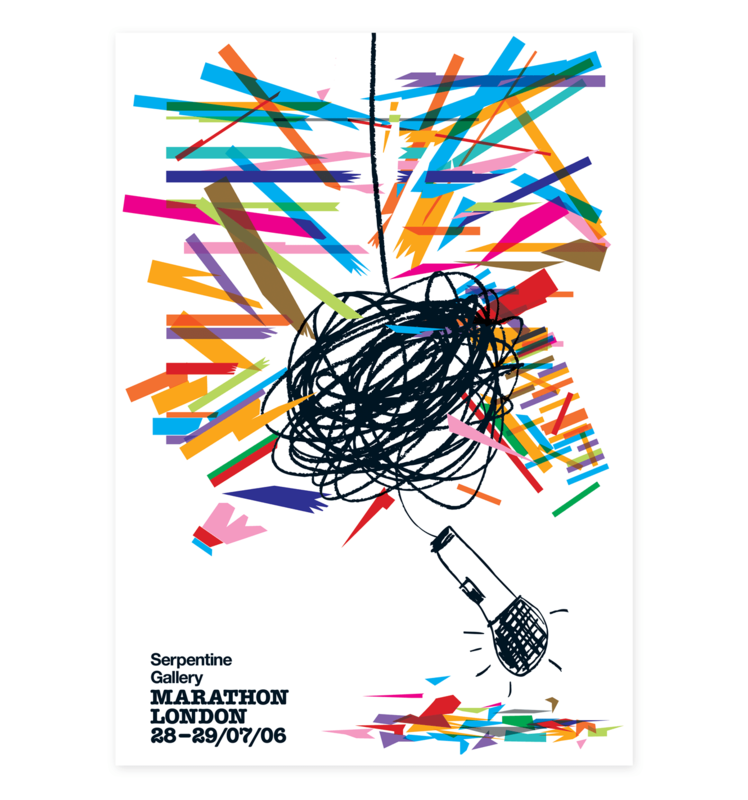 Chaired by the Serpentine Gallery’s Co-director of Exhibitions and Programmes, Hans Ulrich Obrist and Rem Koolhaas, the 24 hour marathon focused on exploring the nature of London with 60 of the greatest names in international contemporary culture. 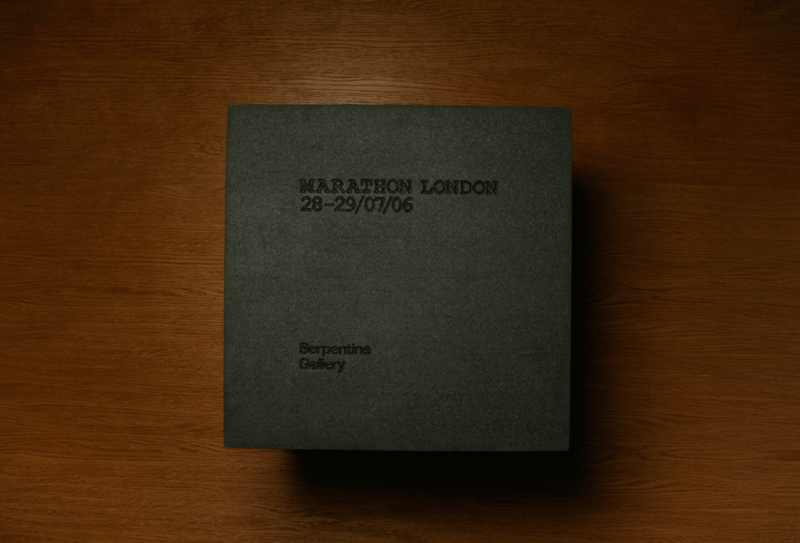 Creatively we document the 24-hour marathon interview event conveying its immediacy, accessibility and highlights. Avoiding the clichéd all angle documentation we implemented an onsite editing process capturing pinnacle moments through a butterfly net process. Simon Brown, founder at &&&, in collaboration with Mark Irving, founder at Visible Impressions Ltd, conceived a flip-book as a way to respond creatively to the 24 hour Interview Marathon. Producing a publication that is deliberately tactile, playful, giving a sense of the speed, excitement and spontaneity at the Interview Marathon Event. 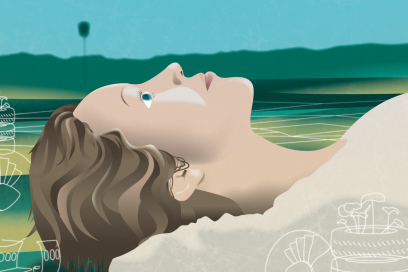 The book features over 150 illustrations alongside text extracts from the interviews produced all on the night, alongside an accompanying a poster and DVD title sequence. Our images of the event are now part of the Art project, powered by Google. David Adjaye, Brian Eno, Charles Jencks,Sir Kenneth Adam, Zaha Hadid, Yinka Shonibare, Tim O’Toole, Hanif Kureishi, Ken Loach, Susan Hiller, Jude Kelly, Tim Newburn, Tony Elliott, David Greene, Sam Hardingham, Tom McCarthy, Scott Lash, Michael Clark, Richard Wentworth, Marcus du Sautoy, Pedro Ferreira, Ron Arad, Jane & Louise Wilson, Cerith Wyn Evans, Squarepusher, Peter Saville, Roger Hiorns, Olivia Plender, Sophie Fiennes, Russell Haswell, Anat Ben David, Damien Hirst, Ant Genn, Shumon Basar, Markus Miessen, Abake, Iain Sinclair, Paul Elliman, Gilbert & George, Caruso St John, Ryan Gander, Julia Peyton-Jones, Eleanor Bron, Giles Deacon, Katie Grand, Doreen Massey, Mary Midgley, Mark Cousins, Patrick Keiller, Jonathan Glancey, Gustav Metzger, Isaac Julien, Gautam Malkani, Richard Hamilton, Peter Cook, Chantal Mouffe, Eyal Weizman, Hussein Chalayan, Tariq Ali, Marina Warner, Milan Rai, Doris Lessing, Eric Hobsbawm, Dame Marjorie Scardino, Denise Scott Brown. “Working with &&& is always a pleasure due to their expertise and experience. They combine cutting-edge experimental design with an understanding of the mainstream and they have delivered outstanding work that has perfectly reflected the Gallery’s programme. We wish them every future success”.